The best thing that could be said about the #BlackLivesMatter Campaign Zero team is that they are an embarrassment, political tourists in the halls of empire. The truth is, however, much worse. In two meetings with Democratic presidential frontrunner Hillary Clinton, they have offered no demands worthy of the name, choosing instead to imagine that they are “pushing” Clinton and the Democratic Party into some stance advantageous to Black people. In reality, the #BlackLivesMatter clique has dissipated the energy – and threat – of angry Black bodies, hands and missiles in motion in Ferguson and Baltimore. Quickly fading is the specter of a Black movement from down below that struck real fear in the Obama administration and much of the U.S. power structure. 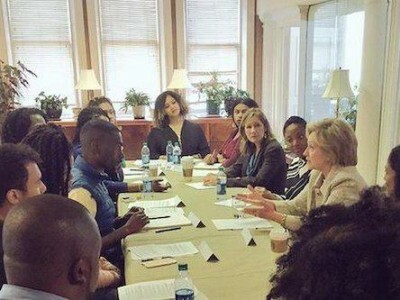 Instead, #BlackLivesMatter provides harmless chat partners for Hillary and the other presidential hopefuls.The #BLM operatives claim they “spent months” studying Clinton’s positions on the issues, in preparation for the meeting. Why? To gauge how far they could “move” the war criminal and corporate thief? Move her towards what? Campaign Zero’s “demands” are an eclectic assortment of criminal justice reform ideas and recommendations, many of them straight out of Obama’s presidential task force on policing, and borrowed “best-practice” police procedures (Seattle is their favorite department). When #BLM folks claim they have “lots” of demands, it actually means they have no core demands, at all.